Trump Gets Blunt at the United Nations Will bracing clarity make things better or worse? We’ll know soon enough. But he said things the world needed to hear. I’m not sure President Trump’s speech to the United Nations General Assembly has been fairly judged or received. It was a strong speech—clear, emphatic, remarkably blunt. The great question is whether the bluntness will tend at this point in history to make things better or worse. We’ll find out soon enough. Often Mr. Trump grows bored with prepared speeches and starts throwing in asides and improvising adjectives. But he was committed to this speech and focused: It looked like Trump believing what Trump was saying. Detractors say, “Oh, his speechwriters just put something in front of him,” but all presidents, from the most naturally eloquent to the verbally dullest, have speechwriters. The point is what a president decides he wants to say and how he agrees to say it. In the end he directs what goes in and what comes out. Mr. Trump explained to the U.N. the assumptions he sees as driving his own foreign policy, which showed a proper respect for the opinion of mankind. He outlined the central problems facing the world as he sees them—a tradition in such speeches, and a good one, for it matters what an American president thinks. He began with the usual bragging: The U.S. economy is improving, and we are militarily strong and getting stronger—and fairly quickly kicked into hopefulness, and respect for the U.N.’s history. All this is the opposite of democracy promotion and nation building and dreams of eradicating evil. The president has spoken like this before. This section was less statement than restatement for an international audience. But there was an interesting question of emphasis. Throughout the speech Mr. Trump stressed the importance of national sovereignty, of countries protecting their own ways and needs. Sovereignty, of course, is crucial. But as he spoke, my mind went back to 1914 and all the fiercely sovereign nations that decided to go to war with each other, putting an end to a unique and rising European civilization. In 1945, after World War II, they put greater emphasis on a more corporate approach, on cooperation and transnational institutions. That path can be abused too, and has been. But it hasn’t been all bad. Is this too hot, or helpful, or both? During the Cold War colorful candor produced a great deal. When Ronald Reagan was drop-dead blunt about the nature of the Soviet Union, foreign affairs was a high-stakes chess game between two superpowers. The context now is a less clearly demarcated world in which anyone with a weapon of mass destruction is, for the moment, a “superpower.” It’s hard to know if blunt talk will excite nuts into greater activity, or if bracing clarity about the risks they’re taking will slow them down, make them question their ambitions and intentions. A great line—because it spoke a great truth—was this: “The problem in Venezuela is not that socialism has been poorly implemented, but that socialism has been faithfully implemented.” Mr. Trump then paused and looked at the audience. It struck some as a “please clap” moment. It struck me as a stare-down: I’m saying something a lot of you need to hear. You’re not going to like it, and I’m going to watch you not like it. Two final points: One is that Mr. Trump is on a roll, a sustained one the past few weeks, and this is new. All levels of government performed well in the hurricanes. Mr. Trump showed competence, focus and warmth. His bipartisan outreach, however it ends, went over well with core supporters and others. 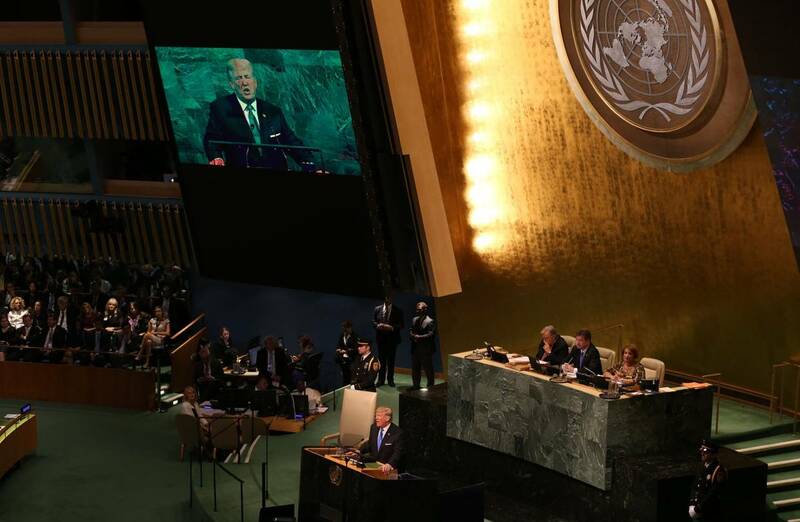 He had a strong speech at the U.N., in fact a successful U.N. week, beginning to end. His poll numbers are inching toward 40%. Which gets us to point two: This is a very important moment for him. History suggests he will ruin it any minute with intemperate statements, wiggy decisions or crazy tweets. He does this because he’s somewhat compulsive and has trouble governing himself. He also does it because he thinks his supporters like it. Some do, but most don’t. He thinks they all do because he misunderstands his base. They should tweet this to him by the millions. Because he does feel some loyalty to them, and it’s possible he might try to listen.